"Hove" is a short film that tells the story of two modern Armenian women whose lives are shaken by an unexpected encounter with the past, and the unresolved legacy of the Armenian Genocide. "Perhaps the greatest strength of writer / director Alex Webb's HOVE (THE WIND) is its very simplicity. 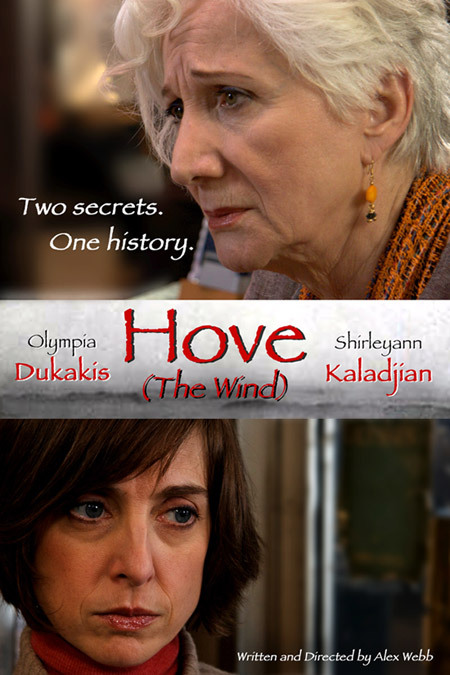 In its hushed and intimate look at the lives of two women, played by Shirleyann Kaladjian and Oscar winner Olympia Dukakis, whose lives are affected in different ways by the legacy of the Armenian genocide, it reminds us of something that is often far too easy to forget about the Armenian tragedy, the Holocaust, or any mass slaughter in history. The numbers, and the savagery, are so monumental, that it blinds us to one of the key things that makes these crimes so singular. The victims were ordinary, everyday people just like you and me. The Turks did not target and attempt to exterminate a group of 1.5 million warlords and mighty men. They were non-combatants. Shop owners, housewives, men and women of no grand distinction. Children. Babies. By fixing his gaze on two people of just this type, each of whom filters their memory of the atrocities through their own difficult experiences, Webb is able to bring this truth painfully home in ways that most films, that attempt to make their characters stand in for all the millions lost, aren't able to pull off. He reminds us that the tragedy is that we lost 1.5 million Armenians...and that we lost a worthy and worthwhile individual, 1.5 million times." Matt R. Lohr, co-author of Dan O'Bannon's Guide to Screenplay Structure, film reviewer at The Movie Zombie, writer for Jazz Times.